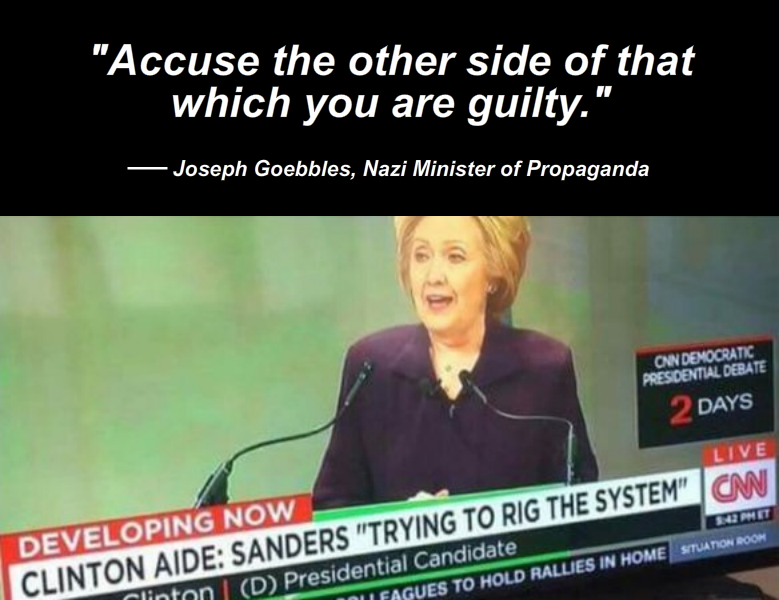 The quote, "accuse the other side of that which you are guilty" is often attributed to Joseph Goebbels. For example this meme and it also appears in me.me and memegenerator.net. I have looked for it in the wikiquote entry about him. I have also checked this article about "Fraudulent Nazi Quotations". None of them mention it. I was unable to find anything resembling this quote in either German or English. While this isn't proof that Goebbels didn't also say the quote in question, a complete lack of any sources at least indicates that someone may have loosely paraphrased him to get a more fitting quote. The earliest date that the quote appeared on the internet seems to be in this relatively recent tweet from May 2015. Above is correct. The quote in question is probably a paraphrase of the quote mentioned by tim above. "We learned the consequences of our neglect all too clearly during the World War. While the enemy states produced unprecedented atrocity propaganda aimed at Germany throughout the whole world, we did nothing and were completely defenseless against it. Only when enemy foreign propaganda had nearly won over the greater part even of the neutral states did the German government begin to sense the enormous power of propaganda. It was too late. Just as we were militarily and economically unprepared for the war, so also with propaganda. We lost the war in this area more than in any other. The cleverest trick used in propaganda against Germany during the war was to accuse Germany of what our enemies themselves were doing." Not the answer you're looking for? Browse other questions tagged quotes nazi-germany joseph-goebbels .